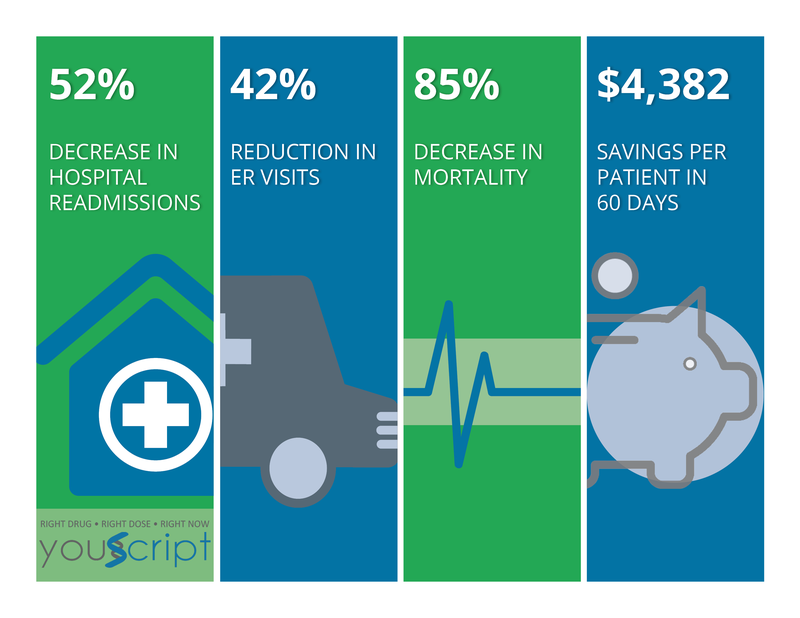 Seattle, WA — YouScript, a proprietary clinical decision support tool designed to assist in medication therapy management, has been shown to reduce readmissions by 52 percent (p=0.007) and ER visits by 42 percent (p=0.045) in patients over 50 taking multiple medications when combined with pharmacogenetic testing. Researchers at Harding University and Unity Health-White County Medical Center, in collaboration with Genelex Labs, a pioneer in pharmacogenomic testing, and precision prescribing software company, YouScript, conducted a randomized controlled trial in a high-risk population of chronically ill polypharmacy patients aged 50 years and older admitted to home health care after an in-patient hospitalization. The trial was designed to incorporate pharmacogenetic data into an integrated clinical decision support system and compare the results to a standard drug information system. This study validates the results of the IMPACT study completed by the University of Utah in 2015 in which hospitalizations were reduced 39% and ER visits 79% in elderly polypharmacy patients in an ambulatory environment in 4-months. In addition to re-hospitalization and ED visit metrics; the new study examined secondary endpoints including death and Medicare administrative quality measures. Risk of death decreased by 85 percent (p=0.05) compared to the control group and researchers estimated a potential per capita cost savings of $4,382 based upon Medicare average all-cause readmission and ER visit cost in only 60-days. The results of the study were recently published in PLOS ONE. The study examined two groups of 50-and-older home health patients taking an average of 11.6 prescription drugs. The mean Outcome and Assessment Information Set (OASIS) score for overall health at the start of intervention, drug count at baseline, and pharmacogenetic risk, the likelihood that testing would reveal substantial gene based drug interactions, in the tested and untested groups were the same. The study population was selected to have a higher than average return on pharmacogenetic testing defined by the likely frequency of drugs interacting with cytochromes or CYPs, enzymes in the liver that metabolize many medications. Drugs are currently prescribed assuming normal genetics for the CYPs when only 7% of patients are normal for all five of the main CYPs. The tested group received a physician order for Genelex pharmacogenetic testing followed by a study pharmacist reviewing drug-drug, drug-gene, and cumulative drug and/or gene interactions in the tested group using YouScript generated reports and clinical decision support tool to provide drug therapy recommendations to clinicians, after which prescriptions were altered at clinician discretion. The second group, a matched untested control group, received treatment as usual including pharmacist guided medication management using a standard drug information resource. The primary outcome measures were the number of readmissions and ER visits at 30 days and 60 days after discharge from the hospital. These findings occurred in a Home Health Agency (HHA) that, according to 2015 Home Health Quality Improvement reporting was already in the 5th – 12th percentile CMS benchmark group for lowest readmissions. The YouScript system combines comprehensive predictive medication management analytics with pharmacogenetic testing to provide an at-a-glance summary of how the complex web of medication and genetic interactions affect patient response to drug treatments. The patented software algorithms analyze patient medication regimens combined with genetic test results to predict the potential for adverse drug events and treatment failures. When potential problems are identified, YouScript suggests alternative medications with reduced interaction risk, taking into account all other relevant drugs, herbals, and genetic factors. “Randomized controlled trials of integrated pharmacogenetic information in a broad polypharmacy population have been lacking. The data from this study offers a potentially important opportunity to minimize ADEs and reduce health resource utilization,” said corresponding author Ranjit Thirumaran, M.Pharm, Ph.D., Director, Clinical Pharmacogenetics at YouScript. Founded in 1987, Seattle-based Genelex is one of the first clinical laboratories to provide pharmacogenetic testing and interpretation. Pharmacogenetic testing examines variations of the cytochrome P450 (CYP) enzymes. While there are over 50 CYP enzymes, approximately five contribute to the metabolism of over 80 percent prescription medications, herbals, and over the counter medications. The Genelex pharmacogenetic test reveals natural variations present in more than 90 percent of people that determine how the body processes commonly prescribed medications. As creators of the patented and proprietary YouScript Personalized Prescribing System, Genelex is a pioneer in comprehensive medication analytics and pharmacogenetic testing. For more information, visit: www.genelex.com. Based on fifteen years of technology development that makes precision prescribing possible, Seattle-based YouScript was founded in 2016 after spinning out of Genelex. The YouScript clinical decision support tool is the only medication management system available that assesses the cumulative effect of a patient drug regimen and unique pharmacogenomic results. Based on over 14,000 curated references and product inserts, YouScript uses comprehensive predictive analytics to interpret and provide an at-a-glance summary of the complex web of genetics, medications, over-the-counters, herbals, and other factors impacting drug safety and response; identifying at risk patients for testing and offering ranked alternatives with reduced interaction risk whenever an adverse interaction risk is found. For more information, visit: www.youscript.com or HIMSS Booth #823.